It’s a Party and you’re Invited! “Bad Behavior Blues Brunch” celebrating the winter seasonal holidays in song and good cheer! 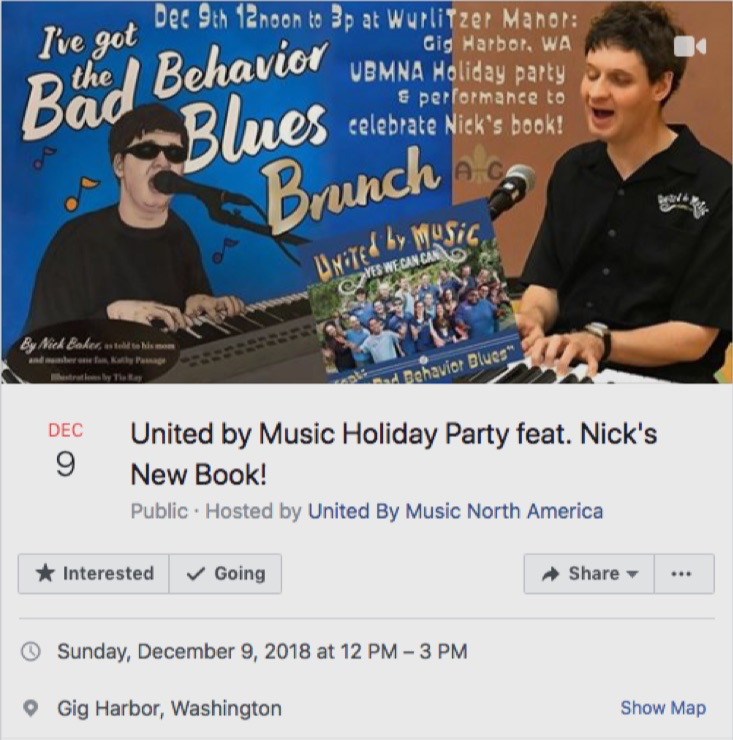 Mr. Nick Baker, United by Music North America program artist ambassador and author, will be with us to present his new book, which shares the name of one of his songs “I’ve Got the BAD BEHAVIOR BLUES”. The United by Music artists and mentors loved working on this song to get it ready to be presented on our UBMNA debut album, YES WE CAN CAN! We are honored to have Nick and his mother, also a writer, Kathy Keesling Passage, on hand to tell us the story of the creation of this book, which is added to Nick’s first book, TURTLE. Nick and the UBMNA band will entertain and musician friends attending are encouraged to join in to share their music during the day. A dish to share and and something to add to the bar.